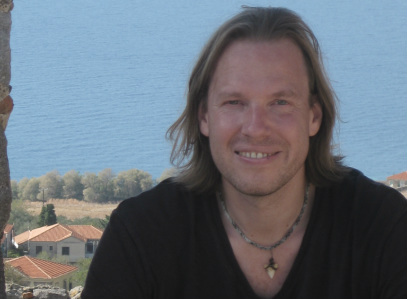 This post is the second part of a brief series looking at David Benatar's anti-natalist arguments. It does so through the lens provided in this article by Elizabeth Harman. Anti-natalism (at least as defended by Benatar) is the view that it is always morally wrong to bring a sentient being into existence. The first part introduced us to Benatar's two arguments for anti-natalism. As noted there, the arguments are supposed to be independent of each other. This first one is an "in principle"-argument and the second one is an "in fact" argument. 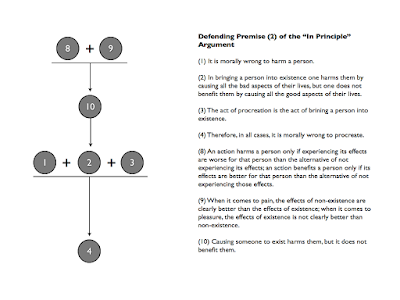 In this entry, we'll look at Benatar's defence of the "in principle"-argument as well as Harman's criticisms of it. This is very strange. It is stating that if you bring another sentient being into existence you are, morally speaking, on the hook for all the bad aspects of their life, but not all the good aspects. What reason might there be for endorsing this premise? Asymmetry Thesis: The presence of pain is bad; the absence of pain is good. The presence of pleasure is good; but the absence of pleasure is not bad. This asymmetry thesis seems, on the face of it, intuitively plausible. However, it does rely on certain ambiguities that will be challenged later on. 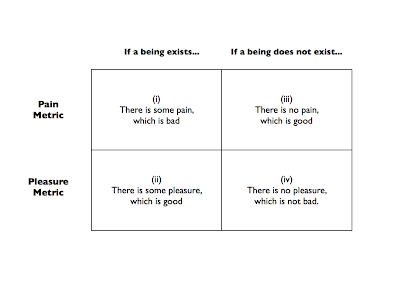 For the time being, we can take it as is and follow Benatar in using it to identify four morally relevant facts about existence and non-existence. We can arrange all of this information into the following table. Now that we have all the relevant facts with respect existence and non-existence in place, what do we do next? Answer: we perform some sort of comparison of the available options. I suspect, for most people, the natural method to employ when comparing the options would be to first work out the overall advantages/disadvantages of existence and measure them against the overall advantages/disadvantages of non-existence. I’d call this the “natural aggregative comparison principle”. Employing this principle, you would find that existence leads to some good things and some bad things, while non-existence leads to some good things and no bad things. But, obviously, this wouldn’t by itself imply that existence is a bad thing. What would matter is whether the good aspects of existence outweighed the bad aspects and, if so, whether they in turn outweighed the good aspects of non-existence. Like I said, that seems like the natural way to perform the required comparison. This is not the method that Benatar uses. And it’s easy to see why not: if he did use this method, his first argument would simply reduce to his second and so would fail to provide independent support for his overall conclusion. So what kind of comparison principle does Benatar use? He proposes that, in lieu of the aggregative principle, we employ a kind of knockout system of comparison. This means that first we measure fact (i) against fact (iii), and then we measure fact (ii) against fact (iv), and then reach some overall inclusion. Or, to put it another way, we measure things along the pain metric first, and the pleasure metric second. Call this “Benatar’s comparison principle”. Doing this, we will find, according to Benatar, that non-existence has a clear advantage over existence when it comes to pain. 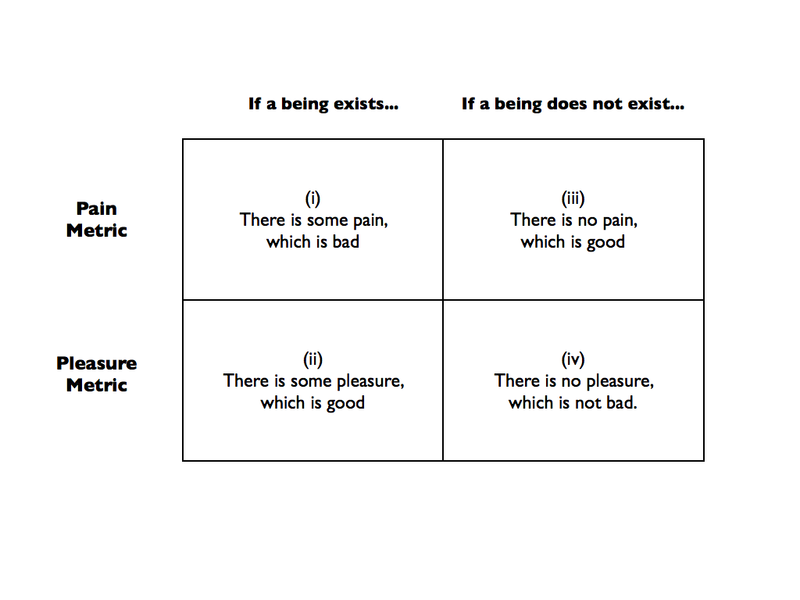 After all, the non-existence of pain is good whereas the existence of pain is bad. Contrariwise, we will not find that existence has a clear advantage over non-existence when it comes to pleasure. This is because the existence of pleasure is good, but the non-existence of pleasure is basically neutral or neither bad nor good. On the face of it, this comparison principle is outright bizarre. And it’s not clear from Harman’s review whether Benatar offers any sort of defence of it. But I’ll leave it to one side for now because there is a deeper question to be asked. The deeper question is: assuming Benatar’s comparison principle is legitimate, what sort of conclusions can be drawn from it? Remember, the goal here is to offer some sort of support for premise (2). (8) An action harms a person only if experiencing its effects are worse for that person than the alternative of not experiencing its effects; an action benefits a person only if its effects are better for that person that the alternative of not experiencing those effects. As Harman notes, this is one way in which to make sense of Benatar’s comparison principle. 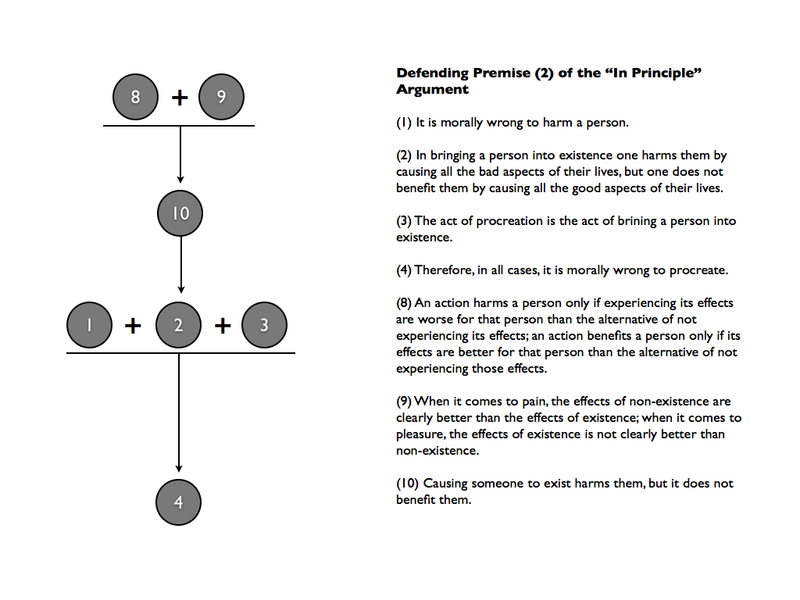 According to (8), harm and benefit are contrastive concepts: something is only harmful if it is worse than its alternative and something is only beneficial if it is better than its alternative. Although I agree with Harman that this makes sense of Benatar’s comparison principle, it does so at quite a cost. I, for one, certainly don’t think harm and benefit can only be understood in contrastive terms. Anyway, nevermind. Let’s continue. (9) When it comes to pain, the effects of non-existence are clearly better than the effects of existence; when it comes to pleasure, the effects of existence is not clearly better those of non-existence. (10) Causing someone to exist harms them, but it does not benefit them. Which is pretty much the equivalent of (2). So we’ve done it, we’ve moved from the asymmetry thesis to the desired conclusion. Or have we? I think there are lots of problems with this argument. As noted above, I can’t see the justification for the comparison principle. What’s more, I’m not convinced that (9) is true. Even if non-existence is not bad, it doesn’t follow that existence is not better. At least, I can’t see how it follows. Surely the pleasure derived from existence could make it better than the alternative of not existing? There are other problems as well. Harman mentions three, which I’ll summarise here. First, the asymmetry principle equivocates on the difference between something that is impersonally bad and something that is personally bad. Roughly, something is personally bad if it is harmful to a particular individual; whereas something is impersonally bad if it is harmful irrespective of whether any particular individual is affected by it. We might think of this in terms of observer or stance independent values and stance dependent values. The most natural way to read the first part of the asymmetry thesis is as a claim that the absence of pain is impersonally good. This is the most natural way because the thesis as a whole asks us to imagine a situation in which a person does not exist and then ascribes goodness to that state due to the absence of pain. This creates a problem for Benatar because if the absence of pain is only impersonally bad, then it does not follow that we harm a person by bringing them into existence to experience pain. That would only follow if the absence of pain were good for that particular person. But this can’t be the case here, because Benatar’s counterfactual involves a scenario in which the person does not exist. In a footnote, Harman writes that, in communication with her, Benatar has clarified that he is making a claim about personal, as opposed to impersonal goods. This, as Harman points out, leads to a second problem. If the absence of something that would have been bad for a person is good for that person even in a world in which they do not exist, then why is it not equally true that the absence of something that would be good for a person is bad for a person even in a world in which they do not exist? That’s quite a mouthful, but I think it makes sense. It can also work the other way round. If it’s impersonal goods that matter, then why would it not be true that the absence of pleasure in the world is impersonally bad? To put it more generally, it seems like whatever can be said in favour of the first part of the asymmetry thesis can also be used to deny the second part. The third problem with Benatar’s argument is that the intuitions motivating our initial acceptance of the asymmetry thesis can be best explained using concepts other than goodness or badness. To be precise, it seems like Benatar is mixing up theories of good with theories of right action. I suspect most people would agree that we have strong prima facie reasons to avoid inflicting pain on other human beings, but that we have only weak reasons to make people’s lives more pleasurable. To put it in the usual philosophical language, avoiding harm seems to be obligatory whereas bringing about pleasure is supererogatory. This effectively accounts for the asymmetry thesis but does so in the language of right actions. The problem for Benatar is that it does not follow from this version of asymmetry that the absence of pleasure is neither bad nor good (as he seems to claim) or that we breach any moral obligation in trying to bring it about. The existence of pleasure might be a very good thing indeed, and we would be well within our moral rights to bring it into existence. This runs contrary to Benatar's main conclusion. Okay, that’s it for now. In the final part, we’ll briefly consider Benatar’s second argument and then address the implications of his argument.